On Apr 26th 2017, I had the opportunity to attend the Berkeley’s 6th Annual Rudd Family Foundation Big Ideas Grand Prize Pitch Day (2017). After months spent developing their Big Ideas projects, seven of the top student teams gathered in Blum Hall. Vying for prizes of up to $5,000, they shared their visions for social change in front of a panel of esteemed judges. Big Ideas is an annual contest aimed at providing funding, support, and encouragement to teams of students that have “big ideas”. Since its founding in 2006, the Big Ideas competition brings together teams of students from across disciplines to design creative solutions for social impact in different field of activity like: Global Health, Food Systems, Energy & Resource Alternatives, Improving Student Life, Hardware for Good, and many more. By encouraging novel proposals and then supporting concrete next steps, Big Ideas is helping contest winners make an impact all over the world. More information is available at: http://bigideas.berkeley.edu/. This year, 326 teams representing more than 1,000 students from 16 universities submitted proposals. Of those, 44 teams were awarded seed funding for their ideas after two rounds of review, and seven were selected to present at the Grand Prize Pitch Day. The judges this year were: Thomas Kalil, Former White House Deputy Director for Technology and Innovation and Big Ideas founder; Christine Gulbranson, Senior Vice President of Innovation & Entrepreneurship (UCOP); Danielle Cass, Silicon Valley Tech Sector Liaison, USAID; Jean Shia, Head of Portfolio and Investment at Autodesk Foundation; and Jeremy Fiance, Managing Partner, The House Fund. Each of the seven teams was given three minutes to pitch their big idea in front of the judges and a packed audience. The presentations were followed by a question and answer session. The judges asked tough questions about each team’s innovation, pilot methodology, sustainability plan, and implementation model. 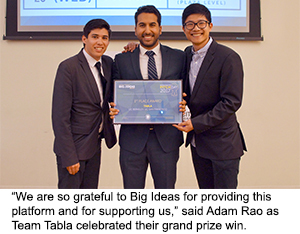 Tabla – a portable, accessible and inexpensive diagnostic tool for detecting pneumonia designed to reduce the number of deaths in populations with limited access to medical infrastructure. Point-Of Care Diagnostic Test for Preeclampsia:a safe and inexpensive self-diagnostic tool for the early-detection of preeclampsia in low-resource settings, allowing pregnant women to seek medical care before symptoms become life threatening. ZestBio: utilizes an eco-friendly, synthetic biology, solution to convert orange peel waste into plastic bottles, thereby “putting your orange juice back in the peel” and eliminating needless waste. Undergraduate Lab at Berkeley (ULAB): a student-run research laboratory to help freshman and sophomores from all backgrounds and skill levels get started in research. This will provide a stepping-stone to further research opportunities and teach valuable research skills in a supportive, education focused environment. HomeSlice:makes it simple and appealing for people who can’t currently afford to own their own property to buy homes in groups, empowering them to build their assets instead of being forced to rent. The event was very exciting. It gave the opportunity for participants and the audience to meet, to discuss their ideas, to share their thoughts and mingle. It was also amazing to see the ambition of young students to tackle major societal challenges. It was a pleasure for me to be there and meet these inspiring people, and I can’t wait to spread the word! Robotics: What does the future hold?